Sale Alert: Android Zone announces SM Baguio Xiaomi Piso sale! Home / android zone / mobile / news / Sale Alert: Android Zone announces SM Baguio Xiaomi Piso sale! As a follow-up to its Mi Papremyo thanksgiving event last year in SM Sta. Mesa and SM Manila, Android Zone is back with another Piso sale! 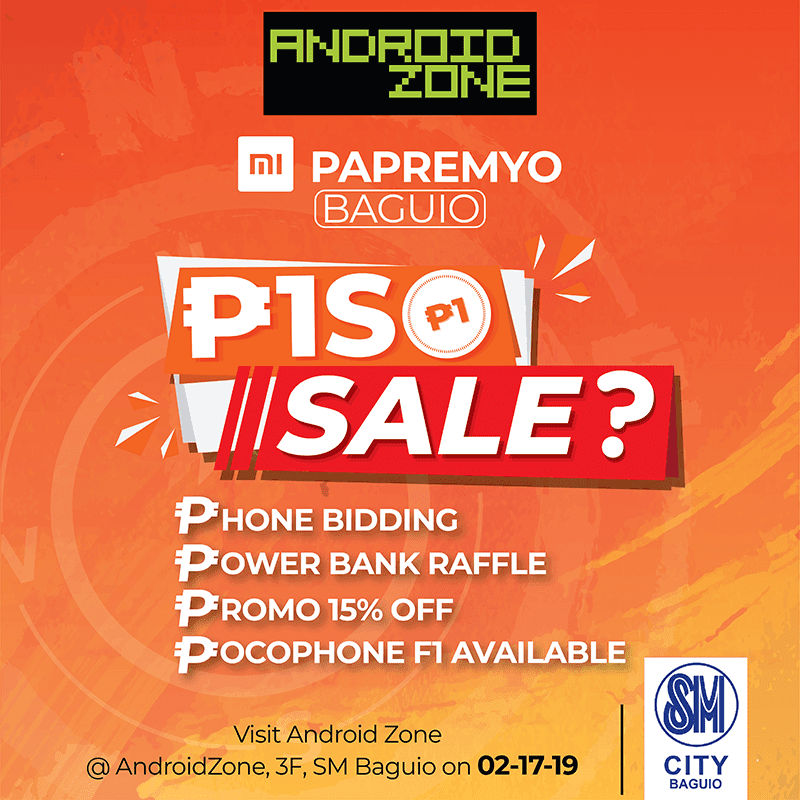 Android Zone will hold its next Mi Papremyo event in SM City Baguio on Sunday, February 17, 2019! Those who will visit Android Zone SM Baguio will get a chance to buy a Xiaomi Mi power bank with 5,000mAh capacity for just PHP 1 only. To avail that promo, all you need to do is buy any Xiaomi product. Android Zone will also hold a phone bidding activity. All the customers who bought any Xiaomi product will get a chance to bid for the Xiaomi Mi A1 with 32GB storage. Price starts at PHP 1,000. Everyone who will join the event can also get a chance to win a brand new Disney, Marvel, or Star Wars power bank. Android Zone also announced that the Mi A1 with 64GB storage is now priced at PHP 9,395 from PHP 10,990. The POCOPHONE F1 with 64GB storage will be available there as well. Other Android Zone stores are located at SM Manila, SM Sta. Mesa, SM BF, and Ayala Cebu.